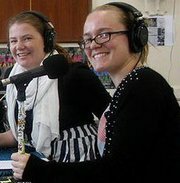 We are volunteers at Radio Adelaide and do “Behind the Screens” out of love for films and the industry. I like movies. I like to snuggle up to them and let them be my friends. When I was little I would tape my favourite movies off the tv and then watch them over and over again until I had memorised all the lines and knew all the ads in the commercial breaks. It was a comfort thing. The bricky VHS tapes were a portal into someone elses’ imagination. What a novel thing! I want to make movies one day. That’s the goal. Radio is a welcome distraction and something that I’d love to continue in some way. I’ve been lucky enough to assist, production manage and produce a number of shorts, music videos and commercials (see some of my credits on my imdb page below). Outside of “Behind the Screens” I also dabble in other areas of Radio Adelaide. I was part of a large student team who put “Y” to air each Wednesday. “Y” was a study on Generation Y, trying to dispel some of the myths surrounding my generation. I am the current audio producer for Radio Adelaide’s public talks program “Public Domain”, 10am on Sundays. Other interests? In 2004 I lived a year in Tokyo as an exchange student. It was life changing and self affirming and I came out of it with a lot of new friends. I credit it with giving me my love for language. Well, that, and Tolkien’s Lord of the Ring’s appendices – linguistics is a beautiful type of science. I’m an emerging producer and avid supporter of community radio! I first fell in love with community radio through Student Radio in 2009. I’m currently working as a Production Coordinator t at the fabulous JDR Screen and producing the short film Dinner with Hugo and the short animation by Robin Tatlow-Lord Donut Holes #2: Donut Gatherers. I also love procrastibaking, markets, beach walks, vintage and all of those fabulously kitsch and hipster joke inducing things.